Made popular by rapper Lil Jon and legendary hustler Bishop Don "Magic" Juan, pimp cups are part hip-hop fashion accessory, part booze basin. Typically covered in gold, silver and stones -- anything from real diamonds to pink rhinestones -- these cups are staples at many bars and a dazzling addition to any glassware collector. 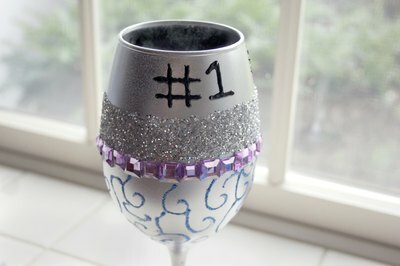 It only takes a few bucks to deck out an old goblet, hurricane glass, oversized wine glass or even fishbowl-turned-stemware -- and once the glue dries, you'll be toasting your crunk juice with the best of them. Select a goblet or drinking glass with a stem. Wash and dry it thoroughly. 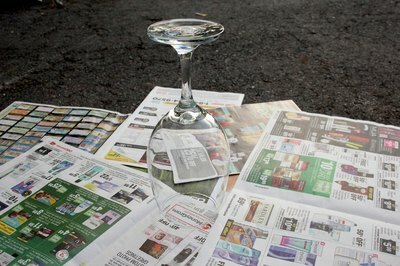 Protect your flat work surface with several layers of newspaper or plastic and set the cup atop it with the rim facing downward. 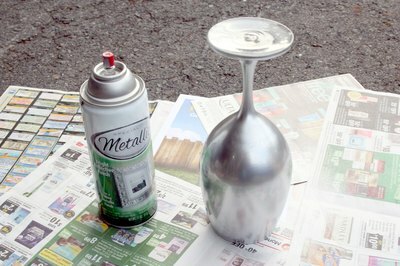 Apply a thin layer of metallic spray paint; do not spray the inside of the basin. Apply additional, light coats of paint as needed, holding up the glass to a light source to ensure no missed spots. Allow the paint to dry thoroughly. Arrange the stones and other sparkly decorations on your work surface in your desired pattern while you're waiting for the paint to cure. Write your name, a nickname, an initial or simply create a pattern of bling. Ideally, leave a small amount of space around the top rim to allow for easier drinking; don't plan to cover the entire goblet with stones. Hold the dried cup so you're looking straight into its basin. Using a piece of chalk or a pencil, lightly mark the cup at its mid-points -- top, bottom, left and right -- so you're better able to apply the pattern symmetrically. You may also want to create a few additional marks, for example, a level line around its circumference to apply letters. You can erase the pencil markings later if they aren't hidden by decorative accents. 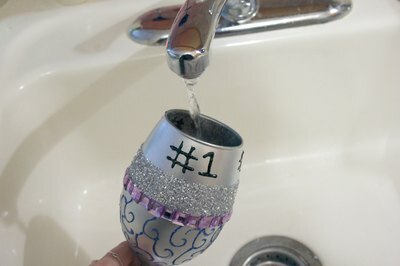 Glue your stone pattern onto the cup, using a small but adequate drop of super-glue for each stone. Be patient and take your time, taking care to place your glue and stones so they are straight and the shapes symmetrical. Work in small sections, allowing the stones to dry on one side before moving to the other. 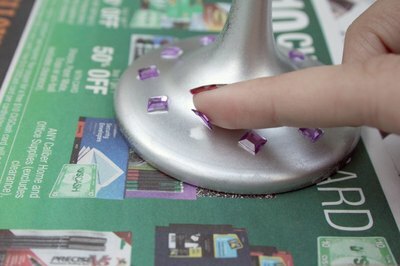 Allow the glue and gemstones to dry thoroughly, and then repair any loose stones using more super-glue. Leave the cup out overnight to fully cure. Erase or lightly rub off any remaining pencil or chalk marks. Wash the inside of the basin with soap and water, taking care not to submerge the outside decorations. Your pimp cup is now ready to use. If you don't have an appropriately shaped glass on hand, purchase a cheap one at your local discount or dollar store. Still can't find the right shape? Look in the home decor section of that same store for a crystal candlestick holder and a fishbowl-shaped candy dish. 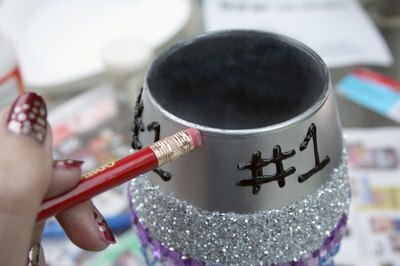 Glue them securely together -- stack the fishbowl on the candlestick holder to form the stem of the goblet -- then decorate. For a more natural look, leave the glass clear instead of covering it in a metallic paint. 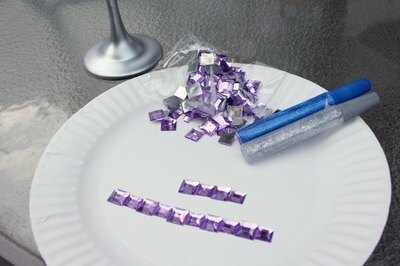 Super-glue is an effective -- and permanent -- adhesive, but it may leave a cloudy finish when used with gemstone decorations that do not have a flat, metallic backing. Try a good, strong craft epoxy if you're looking for a non-clouding alternative that is equally durable. Land of Odds: What Glue Do I Use?